Over 150 residents of Virgin Gorda attended a meeting held by the National Health Insurance Implementation Team on the sister island on Wednesday evening, to get answers to their questions and have their concerns addressed about the new National Health Insurance (NHI) programme. The NHI, which was officially launched by the Government on September 1, is a contributory health insurance plan that provides coverage for legal residents of the Territory, against the cost of a defined benefits package of health services. Members of the NHI Implementation Team included Permanent Secretary in the Ministry of Health and Social Development, Mrs. Petrona Davies; Deputy Director of the BVI Social Security Board with responsibility for NHI, Mr. Roy Barry; Manager for Health Benefits and Referrals, Ms. Norma Benjamin; Manager for Beneficiary and Advisory Services, Ms. Kishma Baronville; and employee, Ms. Susan Daly. Mr. Barry explained that the Government of the Virgin Islands decided to take steps to improve the standard of health care and the standard of living in the Territory, by implementing a National Health Strategy. He said this covers the development of new health care facilities, upgrading clinics across the island, improving health standards, and health promotional activities. The NHI benefits include health insurance coverage for all legal residents, including their dependents; access to a wide range of primary, secondary and specialized health services; choice of public or private providers; contributions based on ability to pay rather than health risk; and overseas referrals based on clinical needs. During the two-hour meeting, a number of questions were fielded by the NHI officials on a range of issues. The concerns ranged from eligibility requirements and benefits for local students overseas, seasonal workers, minimum wage employees, Government workers, persons over 65 years old and pensioners, rental property owners and also non-BVIslanders living and working here, to whether the NHI would be able to collect contributions from work permit exempt persons and defaulters. The residents also questioned the sustainability of the NHI and asked for details on the deductible and the maximum insurable income; why persons were not allowed to opt out of NHI and keep their private insurance; the pre-approval process for overseas referrals; whether the Territory has the resources needed to provide for the health care needs of residents; and whether the cost of medical services would be increased as a result of the implementation of the NHI. 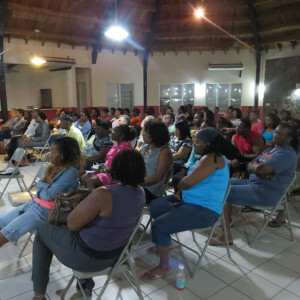 The Team addressed the questions and assured residents that they will be back on Virgin Gorda, in North Sound and the Valley, during October offering convenient registration services. The month of September is dedicated to employers’ registration. The NHI Team will also be going into the communities during October to register the unemployed, the indigent, seniors and others, while November is dedicated to registering children only. The NHI goes into effect on January 1, 2016. Answers to a wide range of questions can be found on the NHI’s website, www.vinhi.vg, where online registration can also be done. For additional information, persons are encouraged to visit the NHI Office at the Joshua Smith Building in Road Town, email info@vinhi.vg, telephone (284) 494-3418 ext. 406, or Like the NHI’s Facebook Page – VINHI.